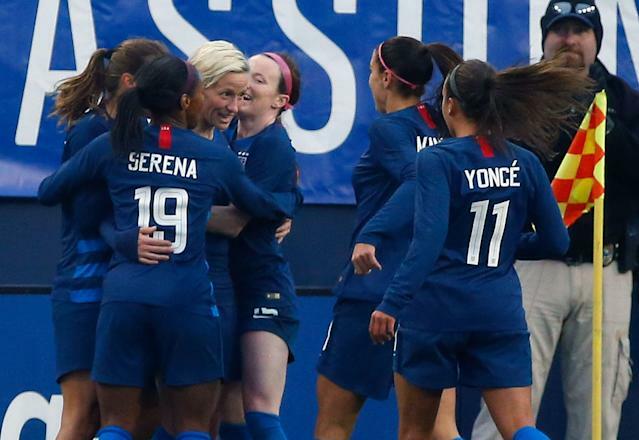 The United States women’s soccer team is an inspiration to fans around the country. On Saturday, the American players honored those who inspire them. For its SheBelieves Cup match against England, the USWNT wore the names of famous women on the back of its jerseys. Among the honorees were Mother Teresa, Beyonce Knowles, J.K. Rowling, Serena Williams and other women from history, sports and entertainment. March is Women’s History Month, and each player had a customized jersey while offering an explanation for her choice. Alex Morgan honored Abby Wambach, the former star U.S. striker who is still the world record-holder for most international goals, men or women. Team captain Megan Rapinoe, meanwhile, chose writer and civil rights activist Audre Lorde. Becky Sauerbrunn honored Supreme Court justice Ruth Bader Ginsburg, whose example has become increasingly important in these tumultuous political times.